New data from research group M-Lab and Cable.co.uk has revealed that for 2018 the United Kingdom delivered an average (mean) broadband download speed of just 18.57Mbps (up from 16.51Mbps in 2017) and ranks 35th fastest in the world (down from 31st) versus 200 other countries. The research itself stems from information gathered via 160 million speed tests, which were carried out across the world. We note that the average UK speed of 18.57Mbps (Megabits per second) is well below the 46.2Mbps recorded by Ofcom’s recent fixed line broadband speeds report for 2018 and is also way off the 50.16Mbps reported by Ookla’s (Speedtest.net) study published earlier this year. Admittedly Ofcom and Ookla used different methodologies to M-Lab but that’s still a big gap. The M-Lab data is useful for understanding our country’s place in the world, although it’s worth reminding readers that such reports make for a poor gauge when considering the actual availability of faster networks. At present it’s estimated that around 95%+ of premises are within reach of a fixed “superfast broadband” (24Mbps+) service – this should rise to 98% by 2020 – and in at least that respect we’re ahead of most EU states. 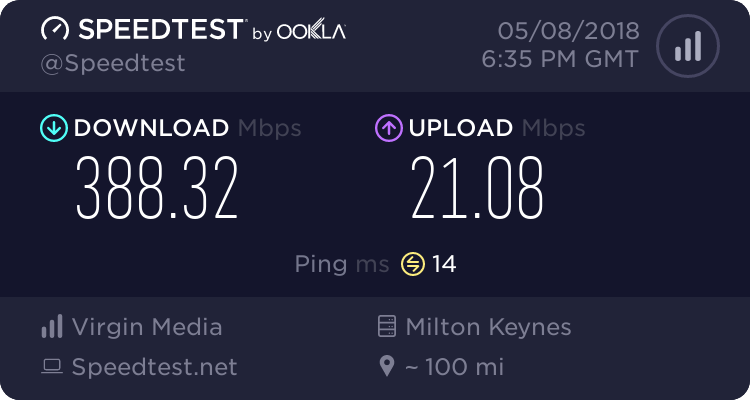 Crucially somewhere around 45% of home broadband lines in the UK are still connecting via slow pure copper ADSL services, even though faster networks are often available in those same areas (i.e. a lot of people haven’t upgraded due to various reasons such as a lack of awareness, higher prices, fear of switching, satisfaction with their existing package etc.). Lest we forget that lots of other problems can also skew results extracted from speedtests, such as slow WiFi, consumer package choice or local network congestion (e.g. running a speedtest at the same time as somebody else is downloading a big file). On the other hand, if we assume that other countries will face the same issues then the new ranking remains a useful indicator of progress and take-up, provided it’s taken in the correct context. “Seeing the UK falling even further behind other EU countries [for broadband speed] is depressing but not surprising, given the UK’s lack of investment in fibre to the premises and other nations’ new networks increasingly coming online. This situation must change – and quickly – as successfully rolling out this superior digital infrastructure is critical for the success of the UK economy and our ability to compete internationally. “It’s encouraging that this report shows UK broadband speeds have increased 12.5% since 2017. I don't know if its just me, but I found the OR reply abit of an odd one. It's like someone hasnt fully read the report or responded directly to it. But just put out a standard statement. I think whether it be from Ofcom or copper profits, copper is holding Openreach back, and they really need to start arguing the case against it to Ofcom, maybe gathering other ISP's on-board too. We know ISP's are keen to sign up to full fibre, with TalkTalk investing in it, Vodafone teaming up with CityFibre. I still think a deal between Sky and BT/OR could be done for full fibre as Sky are moving their broadcasts from the satalite dish to over broadband/fibre connections, so its in their interest to make sure their customers have the best connection they can get. I'm neither 'pro' nor 'anti' ... the latest survey ... got far better things to be getting on with to be honest. 1) 'A spokesperson' (un-named) is pure poetic licence to print what they like. 2) The spokesperson DOES exist but they are doing what they do very well indeed ... 'spinning' .... finding the one positive out of a bag of negatives and concentrating solely on that. Either way, I won't be letting the latest results bring down the mood of the nation (or at least my circle of friends and family), at the moment !! Sun is shining, we're on the cusp of being in a WC Final ..... life is good. Talk Talk are building their own fibre network, why would they want to encourage OR to build one as well, and if they have a way of holding OR back then I'm sure they will do their up most to do that. LLU is holding back OR, and TT have a lot of sway with that. All companies are ultimately interested in what's good for them, not their or others customers. I was meaning TalkTalk investing in the full fibre concept, not investing in OR. I suspect that a deal between Sky and BT/OR is the only potential deal OR could get at the moment as both companies seem to have done a lot of business together recently. @Bowdon you misunderstood the point I was making, if TT persuade Ofcom to decrease regulation on copper then this will help OR which will hurt TT by making things easier for OR to compete against it. Yeah basically as long as the regulatory situation stays the same, anyone building a FTTP network has an advantage over openreach including talktalk since openreach are the only ones regulated all other FTTP players are not, thats what I believe ronski is saying. Ofcom seem obsessed with OR. Something needs to change so it can be a level playing field. Though as you say it'll probably be only OR in the room making the argument. Yes, that's what I mean. It's not in ORs competitors interest to make things easier for OR. The answer is simple and it simply needs Virgin Media to do something like sell a minimum 100 Mbps service, i.e. move all those customers on the 50 Mbps and 70 Mbps service onto their 100 Mbps tier, the effect of just upgrading existing Virgin Media cable customers would add around 2 Mbps to the mean figure for the UK, shifting us up to around position 28 in the league table. A more radical upgrade to make a 200 Mbps the minimum speed sold by the cable operator would add around 15 Mbps to the mean, and propel the UK into the top 10 just ahead of Jersey. In terms of numbers of lines this would mean around 4 million broadband connections would be on a 200 MBps or better service out of the 25.3 million fixed line broadband connections. The bit that stands out to me in the paragraph is the words minimum 100Mbps service. I know advertising now uses the word minimum instead of upto, but just changing the language isn't going to change the reality. I've said some good things about VM recently as far as their work rate is concerned, as well as their visibility. But I have to balance it! The big problem with VM is that its inconsistant. It is more secretative than BT/OR when it comes to projecting the speed you'll get. I don't even know if they give you a speed estimation before you sign up? I just know perspective buyers are saying to the VM people "I'm in area..." "what is the speeds like?". There seems to be a disconnect with some people that just because a technology is available at a certain advertised rate that it will 1. achieve it at all, or 2. be able to maintain it for at least a 12 month period. So making assumptive statements of why people choose a lower level of package isn't showing the reality of the situation. I think the biggest drawback to full fibre is Ofcom obsessively attacking BT/OR's network and giving other network providers a pass. In my opinion it's not enough to say "well that network operator only reaches 100 people therefore they shouldnt have to abide by the rules". If VM and others were under the spotlight as much as BT/OR, and VM in particular became a lot more reliable, then I think we'd have a more competative broadband market. If all the speed packages on whatever network actually achieved that speed then we wouldn't be down at position 35. I think blaming what people are willing to pay for a service only tells half the picture. The other half is we're working with old technology that is increasingly unable to meet the speeds of the packages being sold. PS. I was going to type this on the other forum but I'm not sure if they have a section for discussing their news articles? I think you have missed the point of that ThinkBroadband article. @Bowdon I think you have missed the point of that ThinkBroadband article. I have a bee in my bonnet about the assumption that the service we pay for is the service we get. I pay for 350/20 and I get 381/21 sometimes is does drop a little, but so far not by much. With VM you will always sync above the speed you've purchased, its just that there may be congestion which will limit through put if the area is over subscribed, end result is much slower speed tests. VM have got a lot better than they used to be. I think blaming what people are willing to pay for a service only tells half the picture. this isnt even a major factor now I think, the main providers are managing to get much larger monthly subs from consumers than say 10 years ago, the truth is nearer to "what customers of openreach are willing to pay" rather than "what consumers are willing to pay" as retail revenue levels have skyrocketed vs openreach revenue per end user. The spread of revenue between retailer and wholesale is wrongly balanced, and the regulation is overboard. We probably don't hear much from the large group of people still on ADSL despite something faster being available, perhaps because they aren't that bothered about their speed. That doesn't mean this group doesn't exist. Great point ejs, and absolutely factual. I see it almost daily and it's not just the 'silver surfers' who are happy with their lot .... the younger ones can also be content. If memory serves and the situation is still the same .... our very own B*Cat is still on an ADSL connection .... by choice.